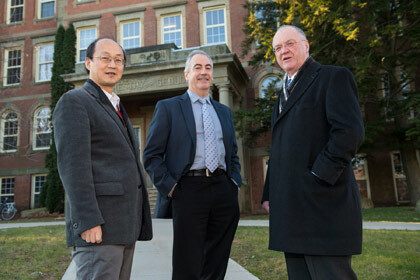 The Honourable Keith Ashfield, member of Parliament for Fredericton, was at the University of New Brunswick in Fredericton yesterday to congratulate Dr. John Spray and Dr. Yun Zhang on funding of $1.9 million from Industry Canada through the Canada Research Chairs Program. “Through programs such as the Canada Research Chairs, we are supporting cutting-edge research at Canadian universities and fostering innovation by helping researchers bring their ideas to the marketplace, benefiting Canadians and improving their quality of life,” said Ashfield. The University of New Brunswick is receiving $1,900,000 to support the work of two chairholders. Dr. John Spray, Canada Research Chair in Extreme Deformation and Planetary Materials, will be examining the exploration, evolution, and resource evaluation of planetary bodies. Dr. Spray’s research is leading to a science-driven, technology-enabled exploration of Earth and other planets via the creation of a unique, world-class centre for research, training, and enterprise in planetary materials. Dr. Yun Zhang, Canada Research Chair in Advanced Geomatics Image Processing, will be developing new technologies for gathering geospatial information from remote sensing imagery to strengthen Canada’s role in the geomatics industry. Spray is director of UNB’s Planetary and Space Science Centre and a professor in the department of earth sciences. Zhang is a professional engineer and professor in UNB’s department of geodesy and geomatics engineering.